peat-drillings between rivers Katingan left and Rungan right superimposed on a Landsat-image 2000. The LiDAR-tracks show in blue colour low and in red high elevation area. 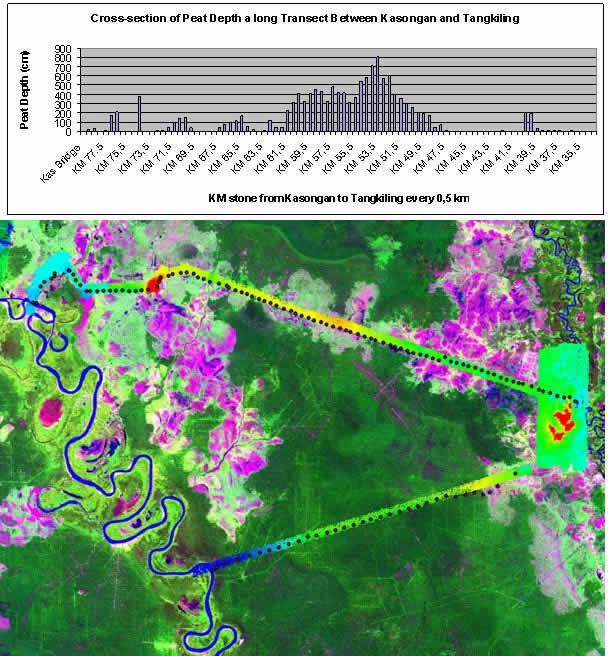 With a high-resolution Airborne Laser Scanner (ALS) the topography of peatlands was measured in August 2007 by a helicopter. With this modern technology we achieve a 3-dimensional Digital Elevation Model (DEM), hydrological data, and bio mass data and combined with peat drillings the amount of carbon storage. The ALS-resolution is in elevation (z) +/-15cm and in x- and y-direction 0.5m. Compared to SRTM-images with 90m x 90m x 5m and Landsat-Satellite-images with 30m x 30m (without elevation) we got much better knowledge of peatlands. DEMs are divided into two types of groups. The Digital Surface Model (DSM) gathers information by Laser Scanner with trees, bridges and house and the Digital Terrain Model (DTM) is filtered using the DSM and shows the topography of landscape without trees, bridges, houses etc. The infra-red Laser sends 100,000 pulses per second and receives many of them in the detector and determines the distance to the different objects. The study area was the Ex-Mega Rice Project (MRP) Blocks A, B, C, E and the Sebangau National Park between the rivers Sebangau, Rungan and Katingan. 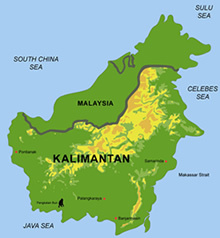 Results will be presented only for the area between the rivers Rungan and Katingan at the upper part of Sebangau National Park. The stored peat volume and carbon for the northern Sebangau Catchment and Palangkaraya between Katingan and Rungan rivers up to the border of the heath forest has 7.1 Gm³ (res. 5.93 Gm³) peat volume. The content of carbon in 1 cubic meter of peat has been measured and is 154.3kg res. 131kg. We found by ALS-measurements and Peat drillings and interpolation a stored Carbon value of 0.92 to 1.1 Gtons for this area.